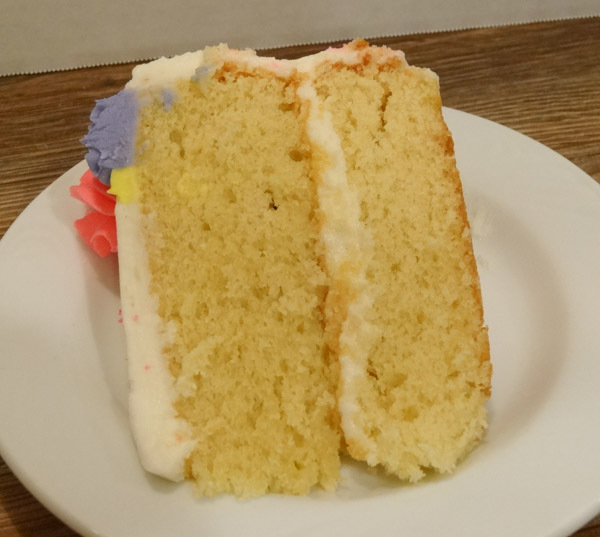 This vanilla cake is made from scratch and is super moist and taste incredible topped with a homemade vanilla buttercream frosting. What makes this vanilla cake such a great tasting recipe? Flavor is my number one answer. It contains buttermilk along with a combination of butter and vegetable oil. Why use butter and vegetable oil? 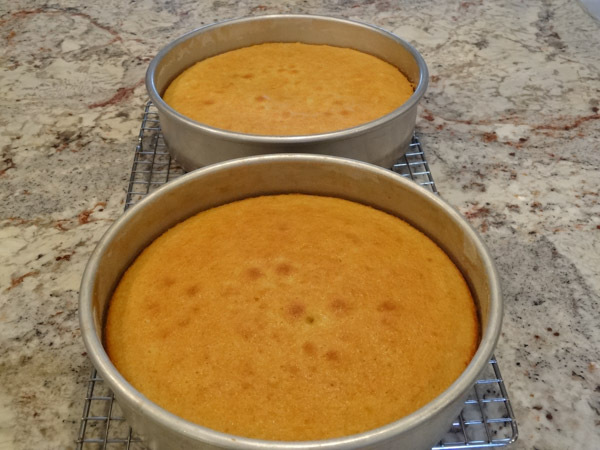 The butter gives the cake flavor depth and the oil helps lock in the moistness. Should you use cake flour or all-purpose flour? To be frank, I’ve tried both. I’m not a hundred percent sold on the cake flour. First, most people don’t have cake flour readily stocked in their pantries. You can make your own version of cake flour by taking out a couple tablespoons of measured flour and replacing with cornstarch. I’ve made this cake with cake flour and all-purpose flour and there wasn’t a significant enough difference in the cakes to make me want to lean toward cake flour at this time. 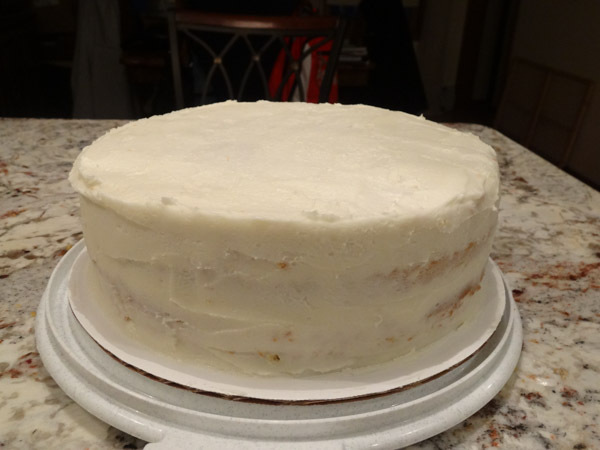 I know people claim that the cake flour will make the cake lighter and fluffier. Again, I couldn’t tell that much of a difference, so I’m sticking with all-purpose flour. If you sift the all-purpose flour, which I recommend, you will end up with a light and fluffy cake. Make sure you use room temperature ingredients. That includes eggs, buttermilk, and butter. Don’t over mix the batter. Once you combine the wet and dry ingredients together, only mix until blended. Don’t over bake. If you stick a toothpick in the center of the cake and it comes out completely clean, you’ve actually over baked. Remember the cake will still cook slightly while cooling in the pan so you’re goal is have the toothpick come out with a few loose crumbs. In large bowl, add in sifted flour, baking powder, baking soda, and salt. Combine and set aside. 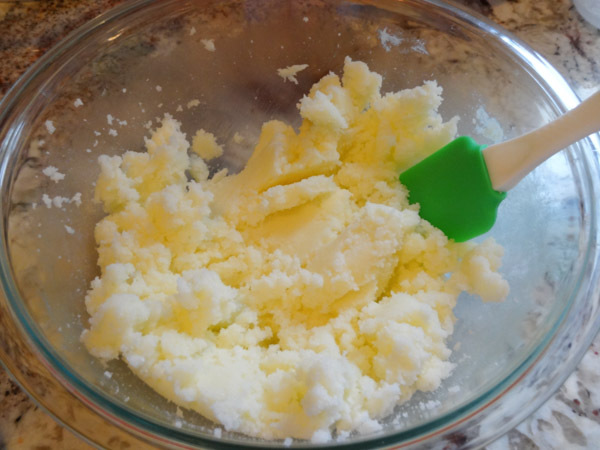 In another large bowl, blend the softened butter and sugar together with an electric mixer on medium speed for 2 – 3 minutes. Add in eggs, one at a time, followed by vanilla extract. Blend until well-combined. Add in vegetable or canola oil and stir until combined. Add in hot water and blend with electric mixer just until combined. 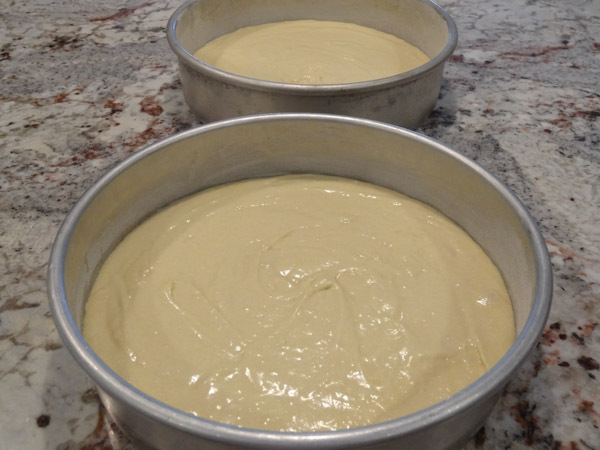 Lightly flour and grease two, nine-inch round cake pans. Line bottom of each pan with fitted piece of parchment paper. (This makes getting cake out of pan so much easier). Pour batter evenly between the two pans. Bake at 350 degrees F for 30 to 32 minutes or until toothpick inserted into center of cake comes out with just a few crumbs. (Start checking at 30 minute mark). Remove pans to wire rack to cool. In large bowl, add in butter, shortening, powdered sugar, and vanilla extract. Blend with electric mixer on medium-low speed, adding in milk (or water) slowly until desired consistency is reached. 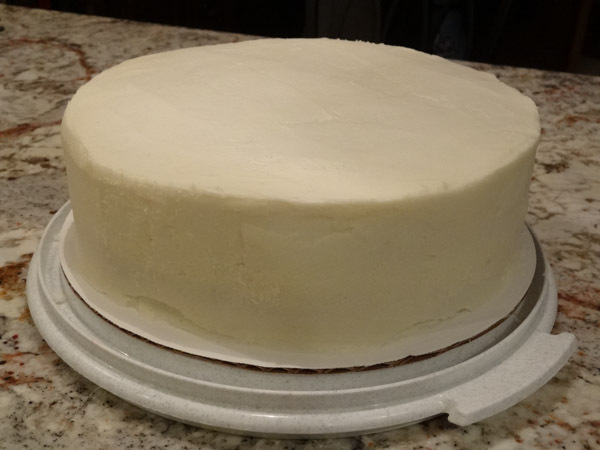 Use an offset spatula to frost thin layer of frosting as a crumb coat or place frosting in large piping bag with Wilton cake icer tip 789 to frost top and sides of cake. If using the tip, there is supposedly no need to do a crumb coat. I tried using the bag with the tip, but I’m new with cake decorating and felt like I had way too much frosting so I then went back and used an offset spatula. 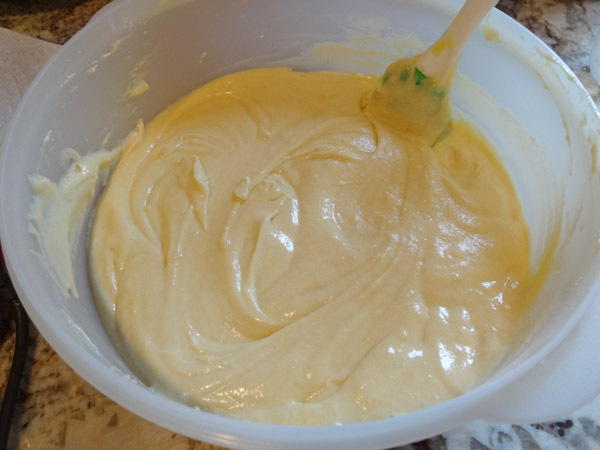 Place cake in refrigerator for 30 minutes and then apply second coat of frosting, smoothing out sides and top as needed. I’m trying to improve my cake decorating skills. I know the sides of the cake could be a little smoother, but I’m not selling my cakes. I’m making them strictly for pleasure and not looking to achieve absolute perfection. If they look pretty and taste great, I’m really excited. 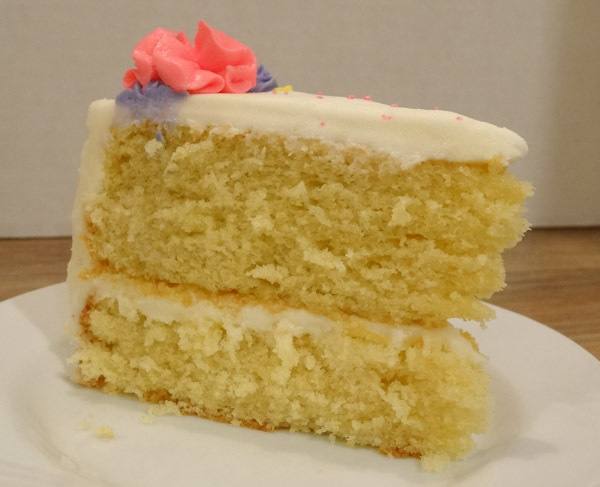 According to the Wilton site, you want the buttercream frosting on the thinner side when frosting the cake (add a little more milk or water). The frosting for decorating needs to be a little stiffer in order for the flowers and decorations to hold its shape. I would recommend placing the frosting while it’s still on the thicker side in separate bowls and then add your gel color. Place colored frosting in disposable piping bags with choice of decorating tips and then you can decorate to your heart’s content! I know a lot of people are leery about adding vegetable shortening to frosting. 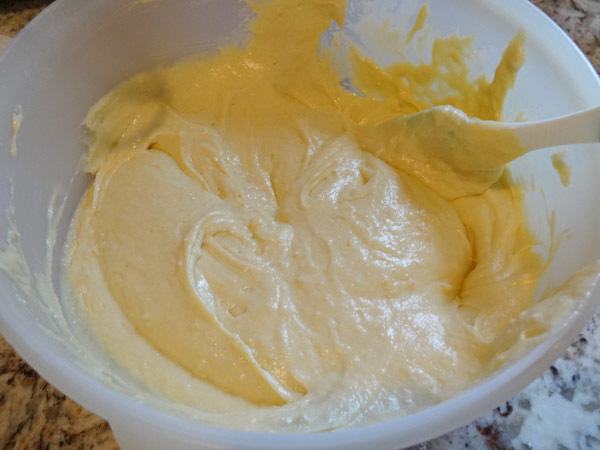 This buttercream frosting has a ratio of 3/4 butter to 1/4 shortening so you won’t get that waxy aftertaste. The benefit of using the vegetable shortening is that it acts as a stabilizer so your decorations won’t droop or melt like they would if you used strictly butter. 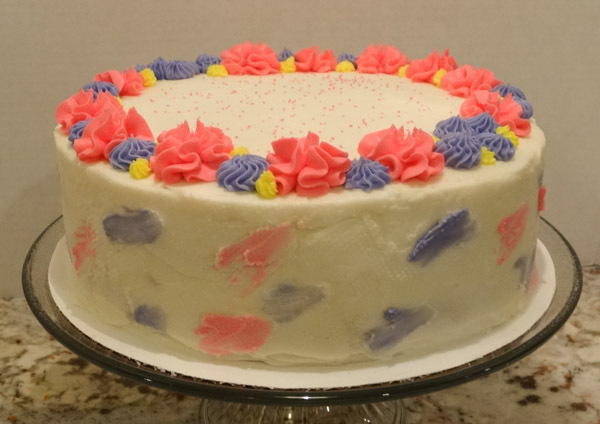 For this cake, I used a 2D decorating tip for the pink. I used tip# 32 for the purple frosting, and decorating tip #16 for the yellow. Hope you get a chance to try this dessert. 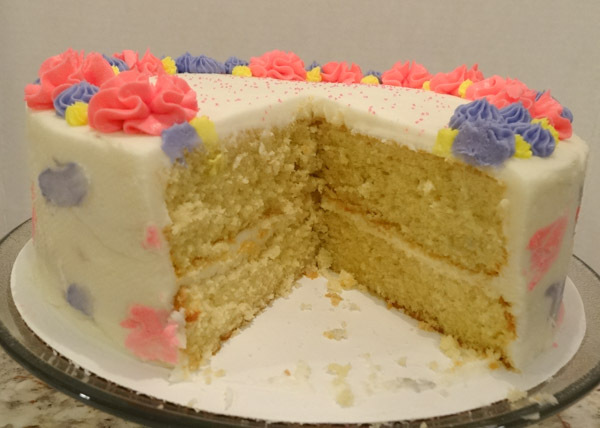 This vanilla cake is made from scratch and is super moist. It taste incredible topped with a homemade vanilla buttercream frosting. 2. In large bowl, combine sifted flour, baking powder, baking soda, and salt. Stir and set aside. 3. 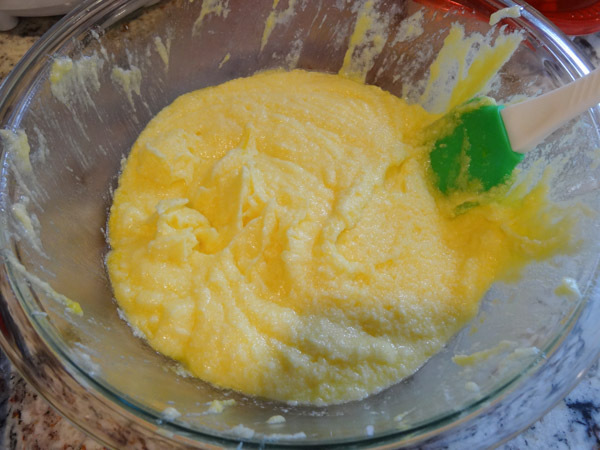 In another large bowl, blend softened butter and sugar together with an electric mixer on medium speed for 2 – 3 minutes. 4. Add in eggs, one at a time, followed by vanilla extract. Blend until well-combined. Add in vegetable oil and blend until combined. 5. Slowly alternate adding portion of dry ingredients to wet ingredients followed by portion of buttermilk. Blend on medium speed, continuing to alternate until all ingredients are incorporated. 6. Add in hot water and blend just until combined. 7. Pour batter evenly between prepared pans. Bake at 350 degrees F for 30 to 32 minutes or until toothpick inserted into center comes out with just a few crumbs. 8. Remove pans to wire rack to cool for 10 to 15 minutes. Invert cakes and continue cooling on wire rack. In large bowl, add in softened butter, shortening, powdered sugar, and milk (or water). Blend with electric mixer on medium speed until smooth in consistency. 2. Continue to add a tablespoon more milk (or water) at a time until desired consistency is reached. Keep frosting thick for decorations and thinner for frosting the cake.